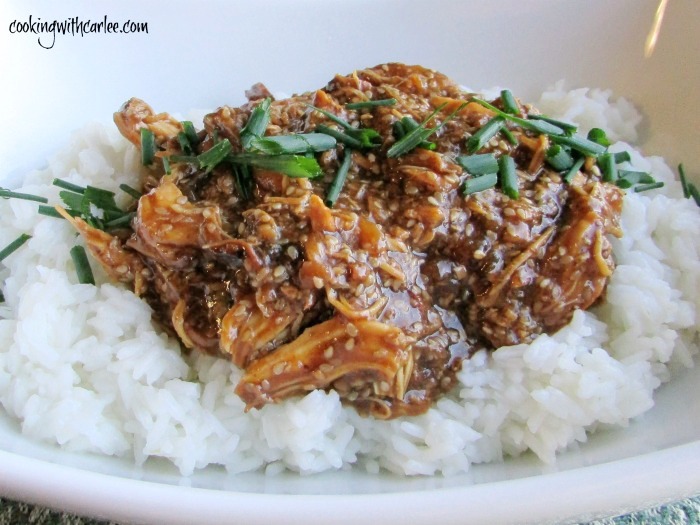 I have been wanting to make a slow cooker version of honey chicken for a while now. The problem is every recipe I saw involved browning bites of chicken and then putting them in the slow cooker for 3 hours. That may work in some situations, but when your work day is 8 hours long a 3 hour cook time isn't exactly convenient. The problem is, cooking chicken in the slow cooker for too long leaves you with mealy meat. It goes from fall apart tender to falling apart so much it is disintegrating and nobody wants their chicken to be mush. So, I made a few adaptations that make getting this ready in the morning super easy. You get to throw in whole frozen chicken breasts! All you do when you get home is shred it and stir in some sesame seeds. It'll be done before you can make the rice to serve it with... even if you use instant! Matt instantly fell in love. He said I can make it whenever I want. Sweet of him to give me permission, isn't it? ;-) Of course I am glad he likes it, and it is so darn easy to make I will be happy to make it every time he requests it. Stir together corn starch and cold water. Add all of the remaining ingredients, besides the sesame seeds and stir to combine. Pour over chicken. Using two forks, shred the chicken. Then stir in the sesame seeds. Serve over rice with green onions if desired. Oh YUM! This is getting made asap. It's so easy and really good! 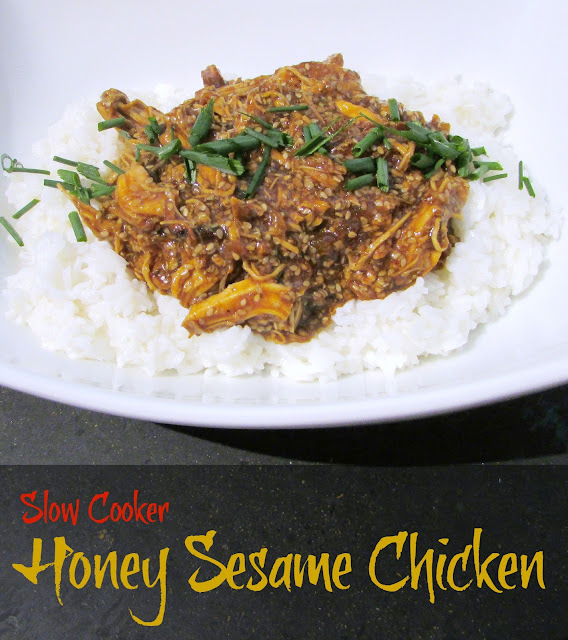 I love a slow cooker recipe that just requires adding all of the ingredients and turning it on :) And the flavors in this honey sesame chicken sound amazing - can't wait to try it! I hate when there is a ton of prep steps for a slow cooker meal. Easy and delicious is my favorite kind of recipe. I hope you love it! Yep, I think my Jay will fall in love with this too!! There is nothing better than a shredded chicken recipe from the crockpot and an Asian one...oh extra YUM!! Aren't they the best! I hope you guys enjoy it! Yay! You'll have to let me know what you think! Hi Carlee, any recipe that is tasty and works in a slow cooker is perfect, and I do agree about over slow cooked meat. I can actually find all of the ingredients here too, which is a bonus (so often I want to follow a recipe only to find there is a main, non substitutable food item in it). If you've been given permission to make it whenever you like, it has to be good! Thanks, Debbie! It is helpful to be able to find everything you need to make it. I live in a smaller town, and we have access to most everything but there are some ingredients for ethnic recipes that we just can't get here. It's disappointing to not be able to try things! Yum! Carlee, this looks so delicious! I'm saving this recipe to add to my slow cooker collection. Thanks for visiting Inspiration Thursday! Oh my, this looks terrific and I love the idea of using frozen chicken. Kudos for a great recipe. Thank you! I kind of feel like if I have to do all of that prep work to put it in the slow cooker, I might as well just cook it on the stove! I always had the same problem with slow cooker recipes. Great if your at home and maybe want to run a few errands, but when you work the timing is a big problem. The short cook ones do have their purpose, but it really just doesn't work for work days. Starting with frozen meat makes it work so much better for busy mornings and has the added bonus of longer cooking time! Thanks Mollie! I cannot wait to try this recipe! Sesame is easily one of my favorite asian flavors, and I love that you make this in the slow cooker! Looks delicious! I love how just a couple of drops of sesame oil really deepens the flavor of a dish, and of course all of the seeds are fun too. Thanks, Jessica. I hope you have a great one as well! I was just recently searching for a slow cooker chicken recipe, couldn't find one and here you are! Thanks for linking up with Funtastic Friday. =) Sometimes things are just meant to be! I hope you love it! Always love new slow cooker recipes. Pinned and shared! Me too! I really need to get in the habit of using mine more often! Thanks, Quinn! This is perfect! And easy. That' the best dinner ever. I love putting the crock pot to work when I'm busy doing other things. And the house smells so good, doesn't it? The smell is a great part and a terrible part all at the same time, it makes me hungry! Thanks, Nikki! Thank you and it is so darn easy too! Win-Win! Hi Carlee, just wanted to let you know that I tried this recipe today and it's gone down a treat. Will be making it again for sure, thinking of trying it with pork too. Yay! I am glad you enjoyed it! I bet it would be lovely with pork. I'll have to give that a try too! It is really tasty and easy, my favorite kind of meal. Good luck with all of the end of school craziness! Our schools have been out for almost a month already and I've been missing the days when I got a summer break too! ;-) See you at the party! 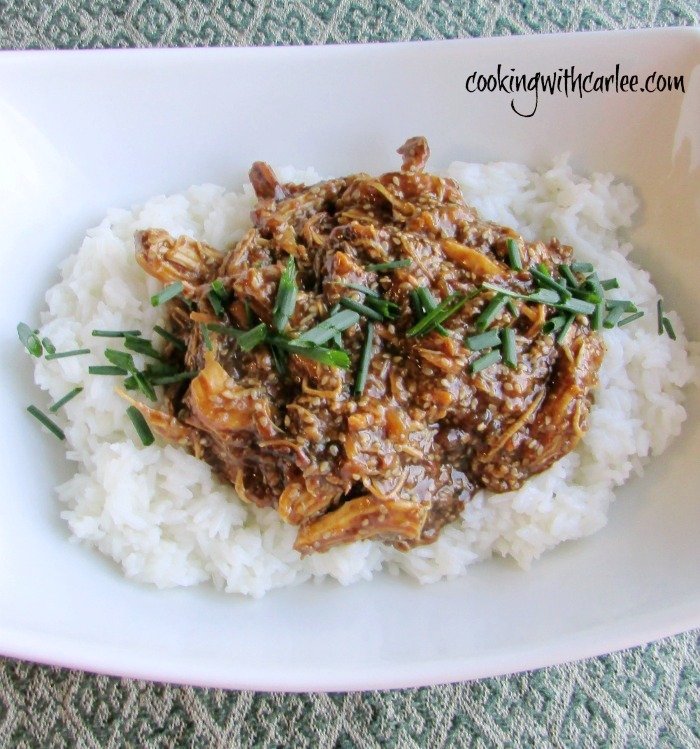 What a great Slow Cooker recipe, it looks awesome! Thanks so much for sharing with Full Plate Thursday and come back to see us real soon! Hi Carlee, I love slow cooker recipes and this looks like a winner!